Embraer's management expects strong revenue and profit growth after 2018. But investors won't believe the good news until Embraer starts firming up more orders for its next-generation jets. Shares of Brazilian aircraft manufacturer Embraer (NYSE:ERJ) have had an up-and-down year. A global glut of business jets and economic weakness in Brazil have continued to hurt the performance of Embraer's executive jet and defense segments. On the plus side, the commercial aviation business has been a steady performer, while the company's cost-cutting program has halted what had been an alarming slide in profitability. Recently, Embraer stock has been falling again, because of concerns about competition from an Airbus-backed CSeries aircraft program. Embraer shares have fallen further in the past few days, after the company projected that its profit margin would decline significantly in 2018. Yet it may not be that hard for Embraer to right the ship. Last quarter, Embraer reported adjusted earnings per share of $0.41. That was well ahead of the average analyst estimate. Revenue declined 13% from a year earlier, but the drop isn't especially alarming. The timing of aircraft deliveries and other projects can cause large swings in Embraer's revenue from quarter to quarter. In the third quarter, Embraer experienced substantial timing-related revenue declines for all three of its main business segments. 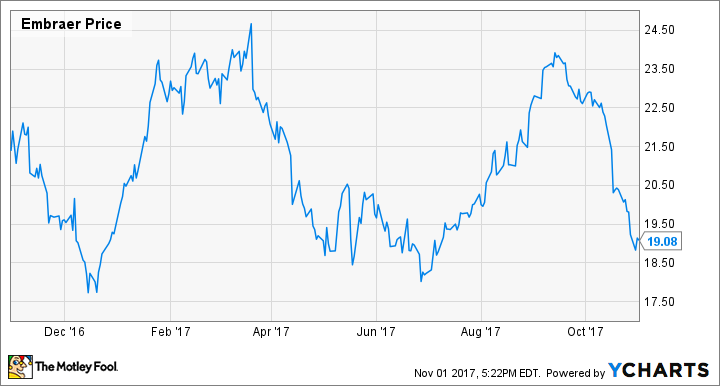 The company's preliminary outlook for 2018 was probably more concerning for many investors. Embraer expects to generate $5.3 billion to $6 billion of revenue and an operating profit of $265 million to $360 million next year, down from projected revenue of $5.7 billion to $6.1 billion and an operating profit of at least $450 million in 2017. The pressure on revenue and earnings in 2018 will come from the commercial aviation segment. Embraer expects deliveries to dip to 85-95 next year, whereas it has been delivering about 100 commercial jets annually for the past few years. In addition, about 10% of the deliveries will be next-generation E190-E2 models, which will initially carry low margin until production becomes more efficient. Embraer will update its 2018 guidance when it reports its fourth-quarter results, most likely in March. One thing that could put investors in a better frame of mind would be an increase in the commercial aircraft deliveries forecast. Fortunately, Embraer has a good chance of reaching the high end of its guidance range in that respect. Strong sales of the E175 have kept Embraer's production aloft in recent years. Image source: Embraer. In September, Embraer captured two big orders for a total of 45 E175s from regional airline giant SkyWest (NASDAQ:SKYW). These orders saved Embraer from what could have been a terrible 2018. SkyWest will take three of those E175s this year. The other 42 will be delivered to SkyWest in 2018. Alaska Air subsidiary Horizon Air is also set to add about 15 E175s to its fleet next year. (The exact number is in flux, because of a pilot shortage at Horizon.) Embraer's order book also shows smaller numbers of first-generation E-Jets set to be delivered to KLM, JAL, Tianjin Airlines, and aircraft lessor Nordic Aviation Capital, among others. In addition, Embraer will deliver roughly eight to 10 E190-E2s next year, based on its guidance for that model to represent 10% of deliveries. All in all, this should be enough to surpass the low end of Embraer's delivery guidance. And just this week, Embraer won another order, this time for 10 E175s from American Airlines, with deliveries spread between 2018 and 2019. There are still a few months left to nail down orders for 2018, which should give Embraer a good chance to reach 95 orders for delivery next year. A rosy medium-term forecast: is it feasible? While Embraer's guidance for 2018 was somewhat downbeat, management indicated that results should improve dramatically over the next few years. Better pricing in the business jet market, a ramp-up in deliveries of the company's new KC-390 military tanker, and a return to building more than 100 commercial jets annually will drive a rebound in revenue and profitability. Investors don't seem to believe it. A lack of order activity for Embraer's E2-series jets is likely the reason for their skepticism. Embraer ended last quarter with 285 orders for E2-series jets, of which 267 have been on the books since mid-2015 or earlier. To make matters worse, 50 of the E2-series orders were placed by a bankrupt Indian airline (Air Costa) that hasn't operated a flight since February. Meanwhile, SkyWest has ordered 100 E175-E2s, but it won't be able to operate those planes unless its legacy carrier partners manage to modify their pilot contracts. That doesn't seem likely to happen anytime soon. The net result is that only 135 of the firm orders for Embraer's next-generation jets are totally solid. That doesn't inspire a lot of confidence in the company's ability to deliver more than 100 annually by the early 2020s. If Embraer wants to get investors back on its side, its task is simple: It must start closing deals for E2-series jets at a steady pace.